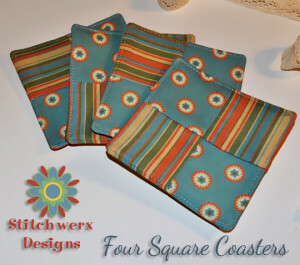 These cute coasters, based on the four square quilt block design, make great gifts for so many occasions. They’re super fast and easy to make and look great on a coffee or end table. This set is sewn using fabric scraps from my Retro Flower Garden Naturals and Naturals Companion original fabric collections sold exclusively in my Spoonflower Fabric shop. Wash & press your fabrics first. 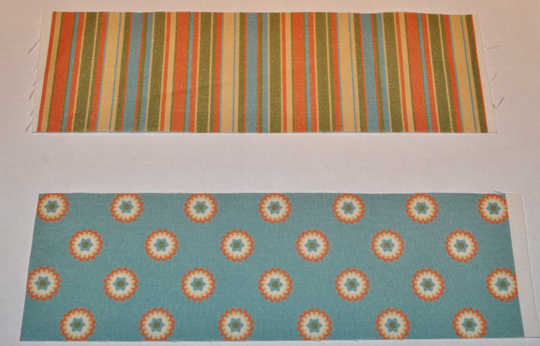 Cut strips from two different fabrics 2 1/2″ wide by at least 6″ long. 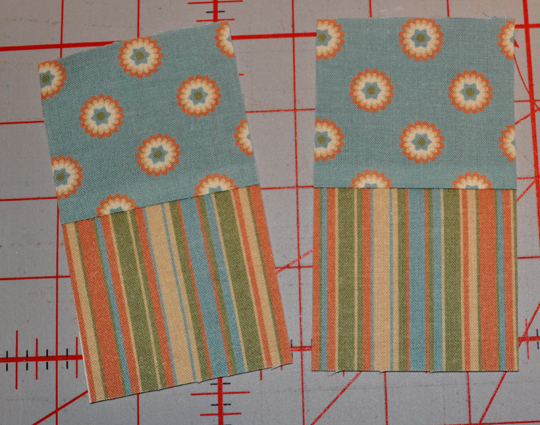 (A 6″ long strip set will make one coaster.) 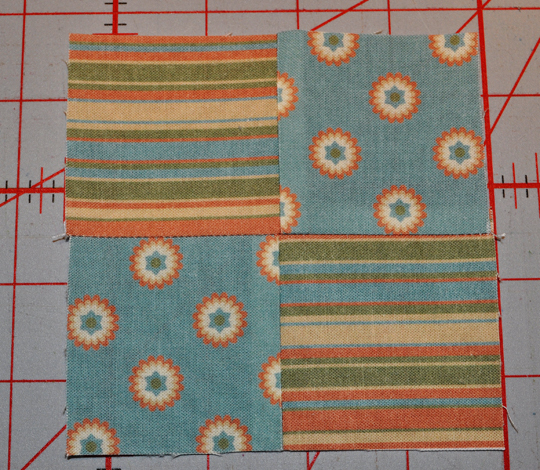 If you are making a set of four coasters, you can cut longer strips or use multiple coordinating fabrics. 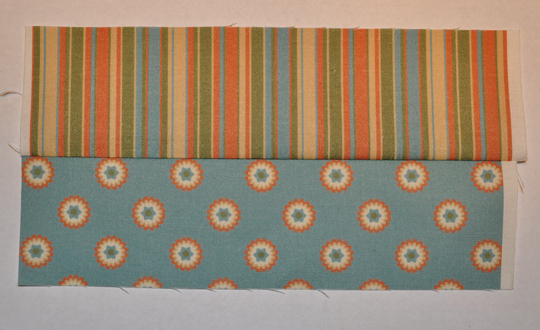 Stitch two contrasting strips right sides together along the long edge using a scant 1/4″ seam allowance. 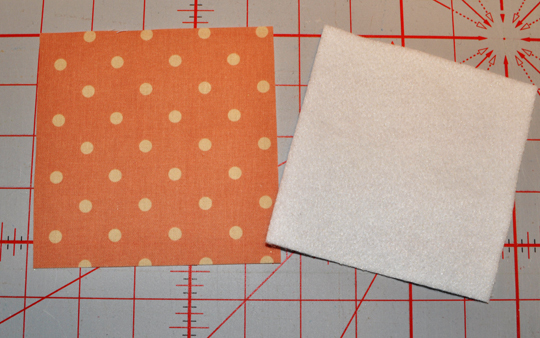 Press the seam allowance to one side (preferably towards the darker fabric). 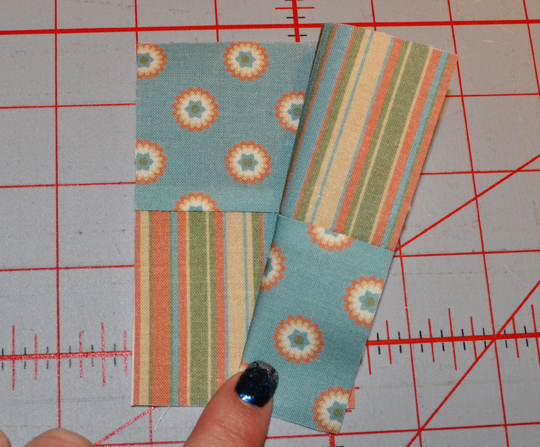 Cut these pieced strips into 2 1/2″ wide sections as shown. Sew two of these assembled sections right sides together matching up center seam and placing contrasting fabrics together to form a checkerboard square using a scant 1/4″ seam allowance. Press this assembled block, pressing seam to one side. 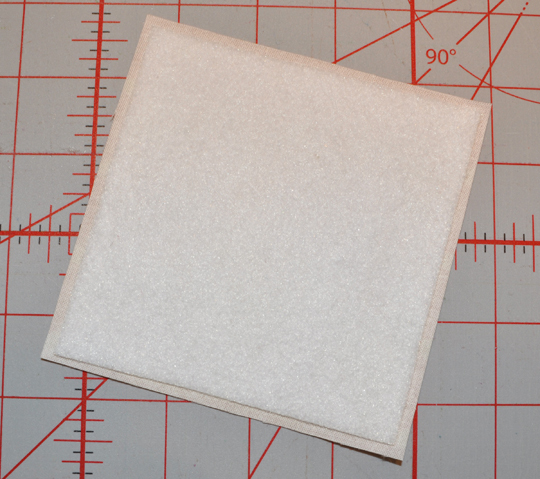 Cut a 4 1/2″ block from another fabric for the coaster back. 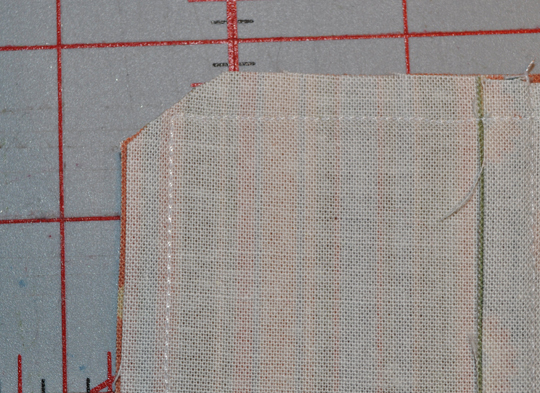 Cut a 4 1/4″ block from the fusible batting. Stitch the backing section to the front block right sides together leaving about 1 1/2″ opening on one side for turning. Clip corners and turn right side out. Press coaster, turning the opening edges in to match the seam line. Stitch opening closed with a Ladder Stitch. The Ladder Stitch is done by forming stitches directly across from each other and through the fabric folds so they aren’t visible on the outside. Read my Ladder Stitch Photo Tutorial to learn more. 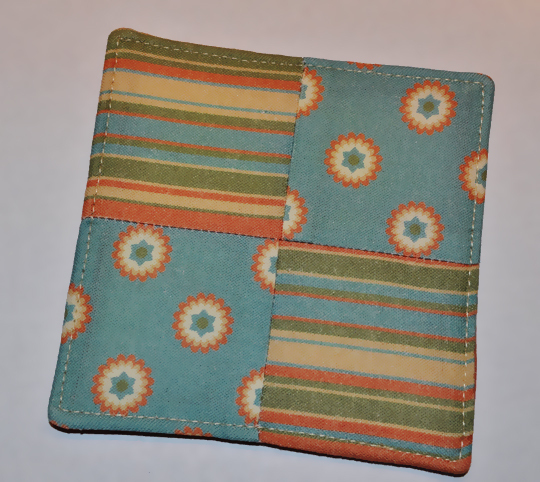 Top stitch all around coaster 1/8″ from edge. 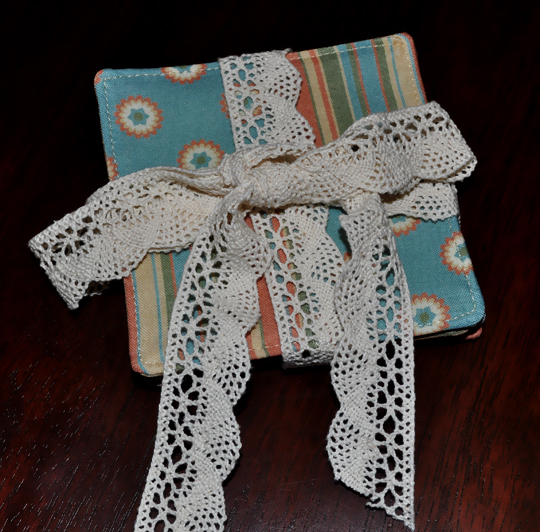 Make a set of four coasters and tie them with lace or ribbon for a lovely gift! This entry was posted in Free Patterns, Home Decorations, Sewing, Sewing Patterns, Tutorials and tagged coaster, coaster sewing pattern, coaster sewing tutorial, coaster tutorial, coasters, four square pattern, four square quilt block pattern, sewing. Bookmark the permalink. In addition to using these for just plain drink coasters, you can slip the bottom of a wine glass in it! Have you tried that? Cute post!